The cacophony of India. That feeling of intense chaos that hits your every sense when you land in India. As an Indian (having grown up in India, but living abroad now) this is an old feeling that is elevated to new levels the moment you land back home. The colors explode at you in new ways that you had not seen or experienced before. There is a sense of newness each time. When I was living in the US, I used to tell my friends there that this is what I missed about my homeland. 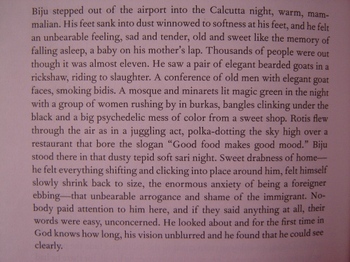 Recently, reading Kiran Desai's book 'The Inheritance of Loss', this paragraph summed up that feeling in ways which I possibly could not have expressed with my limited writing skills. It also captures that feeling of 'coming home'. When the vision is unblurred and we all can see clearly. Obama is your new bicycle. Rock on! !